This is the third in a multi-part series. Here is where you’ll find Part I and Part II. We were then instructed to stand before Guadalupe so that we could be blessed. The sky was dark now, but a soft orange light glowed on the eastern horizon. As Guadalupe blessed the other participants, I kept my eyes on the horizon as the light grew stronger until finally the moon crested. Gradually, it rose to cast a long shaft of soft orange and then yellow light across the sea’s smooth surface. It appeared enormous so close to the horizon, powerful, and surely blessed the occasion with its presence. The full moon happened to be in my astrological sign, Gemini, that night. I watched it rise to the sound of Guadalupe’s soft chanting behind me. Crystal called me when it was my turn and I stood quiet and still in front of Guadalupe as he moved the feathered wand first to my left, then to my right, placed it between my hands as he brought them to my heart. Finally he held it to my forehead. I closed my eyes and said a silent prayer for guidance. Now that we had been blessed, we were permitted to eat our first piece of peyote. Mario had carefully cut a golf ball-sized button into wedges. He showed us how to pick the small prickly hairs off the outside skin before eating it and explained that they made the cactus taste bitter. I imagined they also didn’t feel very good stuck in the roof of your mouth and tongue! I cleaned my piece thoroughly and put it in my mouth. I’d heard that peyote can be so bitter as to make you want to vomit and that some people do indeed. Mario instructed us to chew it down to a pulp before swallowing it. As I did so, I was pleasantly surprised to discover that it tasted much better than I’d expected. It was not bitter at all and had a texture and taste a bit like a cucumber, but with fibrous strings mixed into the soft meat. Next I noticed it also had tiny hard pieces in it, like sand particles. When I’d chewed it down into the texture of baby pablum, I swallowed the pulpy mass down. It was time to enter the temescal. Crystal invited me to enter first. I removed all my clothing except for my bathing suit and a light cotton sun dress I wore over it. The night air was fresh and humid, the sand soft and cool on my bare feet. The sweat lodge is a low structure constructed from PVC tubing and boughs of a local shrub called Palo de Arco (literally “bowed branch” because, like willow, it is easily bent and shaped into bows). The PVC might seem incongruous, but it is practical. The dome-shaped skeleton of soft branches and plastic tubing is covered with many blankets and tarps all the way to the ground. The result is a pitch black cocoon-like space that retains the heat and steam of the hot rocks. There is a hole in the ground at the center of the tented space that is about three feet by two feet wide and almost three feet deep. This is where the hot rocks are placed. I squatted down low and, duck-like, entered the lodge where the tarps and blankets were thrown back to create a low doorway. Fernando began to bring in the now white-hot rocks one at a time. As each rock was dropped into the pit, we all chimed, “Bienvenida abuelita! (welcome little grandmother).” As the rocks were placed, I could feel their heat snaking up out of the pit and across my legs. After seven had been delivered, Fernando came back into the lodge with a bucket of water and the door was closed tightly behind him. Crystal took the bucket and after chanting something I didn’t understand, poured the water onto the rocks in a constant slow stream. A strong blast of steam rose and enveloped us. Outside, Guadalupe continued to chant his mysterious prayer songs. The first thing I noticed was that the steam did not burn the inside of my nose when I inhaled, like it had the first time I participated in the temescal. Others were breathing quickly, as though under stress, but I settled in and felt the heat enter the cells of my body. Crystal began to sing a spiritual song. I closed my eyes and began to move slowly side to side in time to the beat of her song. Once the steam dissipated, Fernando left the lodge again to move more hot rocks from the fire into the pit. Again, we sang out, “Bienvenida abuelita!” as he dropped the rocks from his shovel blade, one by one into the pit. This time he brought 13 rocks in total and I felt the energy in the small space rise as we all anticipated the stronger heat they would create. Another bucket of water was brought and, once the door was sealed, poured over the rocks. The intensity of the steam was acute, yet I felt remarkably comfortable and hummed along as Crystal sang. Someone began to chant Om and I joined in. Mystified at how comfortable I was, thinking I had not even broken a sweat, I reached up to feel my face only to discover that I was, in fact, sweating profusely. I guess this is an effect of the peyote, I thought and was grateful that I was more comfortable in the sweat lodge this time around. I closed my eyes and appreciated the feeling of the humid, heavy heat. At one point I opened my eyes and saw an oblong blue light above our circle. There were two dark spots at the top of the shape, where it was widest and a dark line running vertically down the lower three quarters. I knew it hadn’t been there earlier, but guessed one of the blankets on top of the lodge must have blown back to allow the light of the moon to glow through a blue tarp. But when I listened for the wind, I heard nothing. When the sweat lodge ceremony was over, we crawled out of the small sandy space one at a time. I removed my dress and, as instructed, poured cool fresh water from a 50 gallon barrel over my head and body to cleanse myself of the toxins I’d just sweated out. The water was quite cool, but I enjoyed the sensation of it washing over my body. I dried off and put on warm clothes. One by one, we gathered around the fire while Fernando busied himself adding fuel. Blankets were laid out around the fire to sit or lie on. I joined Crystal on one and wrapped myself in a heavy blanket I’d brought to guard against getting chilled. The heat from the fire felt good and I turned slowly in a circle so it would warm my whole body and help dry my hair. I took another wedge, cleaned it, and chewed it to a pulp. I described the blue light I’d seen and turned to Crystal to ask her if the moon had shone through the roof of the lodge, but even before she answered, I suddenly realized I’d had a vision of the head of a blue deer. The Venado Azul is the guide, messenger, and guardian of the sacred land the Huichol call Wirikuta, where the peyote cactus is collected. This spirit deer also symbolizes peyote and their names are sometimes used interchangeably. 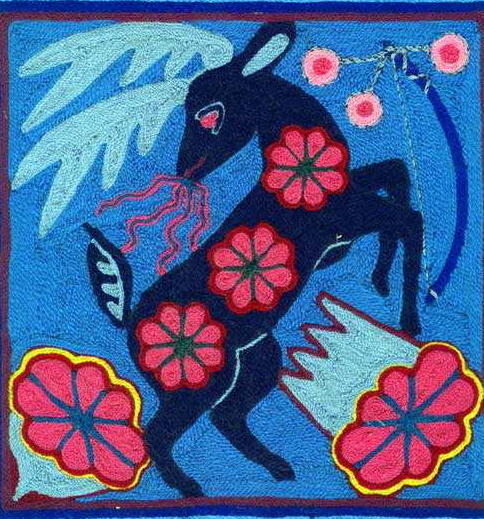 The Huichol refer to “hunting the blue deer” when they go on pilgrimage to Wirikuta to collect peyote. I sat and questioned what I’d seen. My mind, the product of years of scientific and western dogma struggled to accept what I knew on a more visceral level to be true. Ayax’s vision was so similar. I felt a wave of understanding pass through me and acceptance of their explanation seemed to make me feel lighter. I felt my chest open and expand as I decided that the vision of the blue deer was a sign that my quest to know Hikuri was not misguided. In Part IV: The Portal Hikuri extends an invitation to travel to another world. Will I go?